AM: Easy 4.25 around the neighborhood. Maybe some cross training later. 10 miles on the PR in 1:16 something-or-other. Ran with Blake, Cubby, Zach, Read, and a few of my fast young Freshmen and Sophomores. Had the new kids stop at 6 miles. 21st wedding anniversary today. Ann and I are escaping the heat for dinner at The Silver Fork Lodge up in Big Cottonwood Canyon tonight. Easy morning run around Liberty Park. 5ks - used to run them practically every summer weekend. Now, not so much. It's a hard race if you run it right. Of course that's true of every race, but 5ks seem different to me. I'll run Draper Days in a couple weeks and see if I can dip under 18. It's a much faster course than the Sandy Classic. I ran 4 seconds faster than two years ago when I was a youngster of 48. So this is my Sandy Classic PR. Late AM: 1 mile walk in the Highland Park 4th of July Parade. Run through the fire hose after. AM: Easy run at Liberty Park plus six quality striders. Some rope skipping, push-ups and core after. 12.5 miles of trail and dirt road running. 4.25 miles ROLLING on the Jeremy Ranch Road finishing at Mormon Flats where Ann and Andy were hiking. I found an excellent deep hole in the creek next to the road at Mormon Flats and soaked and swam in it after the run. Then I split a pizza and a chocolate milk from the Jeremy Ranch Store with Andy on the drive back home. 14.25 miles in 1:51:16 up and down City Creek Canyon. AM: 2 mile walk with Andy. Close to 1 balancing on the rail on the abondoned tracks next to the PR Trail. Stopped twice to pet a kitty and a zebra. PM: Walked to the gym. 4 eliptical miles. Weight lifting. Swimming. Hot tub. Swimming again. Shower. Walked home. Ann is trying to figure out how to purchase one of them smart phones. 8.25 miles around Sugar House. Had to remind myself that, even though it's summer and I have more time, not every run needs to be EPIC. PM: 4 miles treadmilling at the gym. AM: 4 mie walk around Sugar House with the Ann, Abby, and Andy. PM: Easy 3 miles, 2 with Abby. We are racing the Murphy Family 5k tomorrow morning on the Highland High track. Not really sure what I was doing out there today. Ate the F up to use an old Army term. Started out wanting to do a 5k time trial. Came through the mile in 5:45 but aborted after 6 laps. Ran with Abby the rest of the way. Aimlessly wandered a few miles after that with no real purpose other than to log some miles. Sub-par past couple days with regards to running. On the plus side, Mike Trout hit two home runs for the Angels last night to pull into a tie with teammate Albert Pujols for the AL lead going into the all-star break. 20 miles in 2:29:56. Circling around Sugar House. It wasn't easy from a mental standpoint. Should have done an out-and-back on a mountain trail but couldn't swing it with family logistics. Easy 7 in the gully before my runners arrived. Solid strength workout after plus some swimming. Page 106 in John L. Parker's new novel about Quenton Cassidy has young Quenton beating Dunedin's Del Ramers in an 880. Ramers went to my high school and holds the school record in the mile (4:10 run in 1969) and went on to a solid career at Florida State. If you google Del Ramers, Dunedin you can learn more. AM: Ten miles in 1:13:33 on the Porter Rockwell Trail with Cubby and Chase. Felt pretty good after a day off. PM: 4.5 easy miles at Liberty Park. Included some fast striders. 10.5 miles at Alta Ski Area. Beautiful up there today and I felt like running for hours but I'm racing Saturday and I'd like to have a little zip in my legs. Four easy in the afternoon heat - which really wasn't that bad. Two miles of warming up and cooling down. I count this as a hard day. AM : 8.25 miles in the gully at practice. I'm a little sore from the weights yesterday but not as much as I have been. I'm starting to think the body adapts to specific stresses placed on it. Will look into the research. Whew! 14 miles on the Flying Doggie today in the late morning, early afternoon. That run kicked my rear end. Wiped out pretty good coming down. Ouch. Legs were sore from the DOMS from Sunday's weights. Averaged 8:30. My Aunt Marj in Portland is very sick and just went into hospice so I have cancelled my trip this weekend to the Boulder Running Clinic in favor of a trip to Portland to see her for probably the last time. Super cool person, one of my favorite relatives. Drove to Baker City, Oregon today. Staying at the local Best Western, a small outpost in the world's largest lodging chain. On to Portland tomorrow after a visit to the Oregon Trail Interpretive Center here in Baker City. Early 4 miles with Abby in Baker City before getting on the road. 300 miles to Portland. No running here in one of the best cities for running in the world. 2.83 miles around the motel in Klamath Falls, Oregon. Possibly the crappiest town for running in a state known for running. Klamath Falls is the anti-Oregon. If you don't like the progressive, healthy, outdoorsey, hipster Oregon, this is the place for you. A decent run on this trip. In fact, probably a bucket list type run. 14 miles in Crater Lake National Park - most of it following the Rim Trail around the lake and about 3 miles with Abby. The last two miles was down the Cleetwood Cove Trail to the lake where Abby and I jumped from a 20 foot rock into the lake. That was fun. Look at Abby's new picture to see what that was like. Hot tubbing now at our hotel in the thriving metropolis of Burns, Oregon. Back home tomorrow. Six easy miles around the neighborhood after a LONG day in the car. 14.5 hard mid-day trail miles in Park City. 8:45 average. Abby said I needed to change my profile picture and that she had an "awesome" one. By awesome she meant a sideways picture that is too smal with me in the shadows. AM: Easy 6.25 miles on the Porter Rockwell Trail. Typical Thursday Alta run except I held way back what with a race on Saturday. Ran the last three miles down the mountain with Abby at about 8:50 pace so hopefully my legs will appreciate that on Saturday. AM: Couple miles walk-jogging around the neighborhood with Andy. 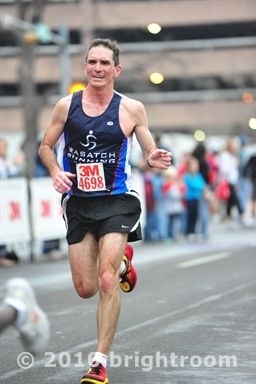 Saw Jon Kotter running at a fast clip up Stratford Ave. only 1 week after his Des News win.